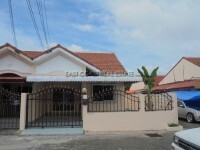 Raviporn City Home - This 2 bedroom villa located in a 24 hrs. security and quiet place. These not too far from the city and approximately 20 minutes from Pattaya City, Jomtien beach and all of the shopping centre in town. The villa is easy access to the Bangkok motorway, Route No.36, close by many golf courts, international school, local school and etc. It is for sale in Thai name ownership and 50/50 transfer the tax and transfer fees by seller and buyer.